The Iowa Department of Public Health (IDPH) recognized leaders in Iowa nutrition and physical activity at the 2015 Iowa Governor’s Conference on Public Health, held in April in Cedar Rapids. The IDPH Bureau of Nutrition and Health Promotion will recognize Judy Gale of MATURA Action Corporation, Jennifer Walters of Dallas County Public Health Nursing Services, and Palmer Lutheran Health Services. Jennifer Walters is being honored with the ‘Nutrition Emerging Leader’ award for her efforts to raise awareness about hunger, nutrition and health in a way that moves individuals to action. In just over a year, she has completed a county food assessment, leveraged fresh produce for over 800 Dallas County residents in conjunction with the Food Bank of Iowa, and partnered with Outreach, Inc. to host two meal packing events. 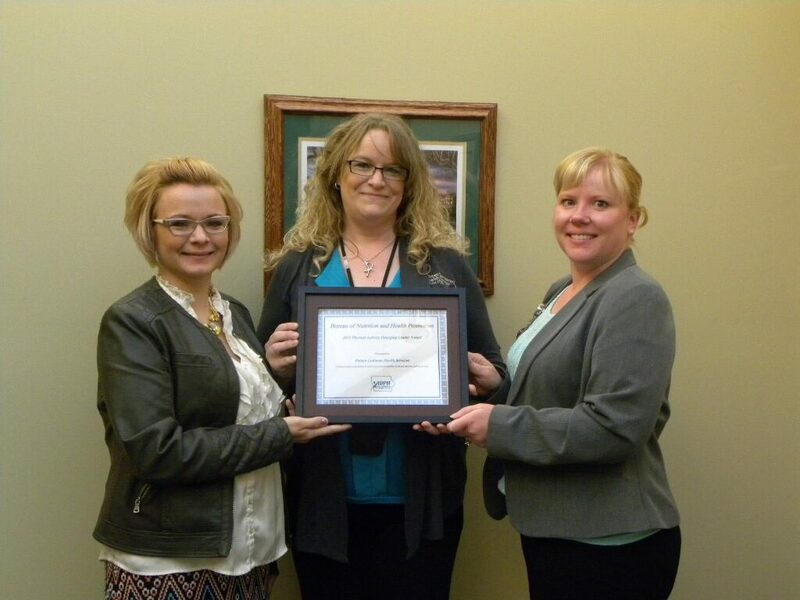 Palmer Lutheran Health Services is receiving the ‘Physical Activity Emerging Leader’ award for being the driving force behind successful Safe Routes to School (SRTS) efforts to increase physical activity among youth and safety within communities in Fayette County. Palmer provides SRTS leadership, community outreach and engagement, volunteerism and resource support. Since 2010, they have led three I-WALK projects, nine walking school buses, three bike rodeos, and four community coalitions in Fayette County. Awardees must emulate the IDPH bureau’s vision of “an Iowa where healthy living is accessible valued and supported by all.” The winners must strive to make the bureau’s mission a reality by “ensuring that Iowans have the opportunity to live a healthy lifestyle by providing education and resources, building partnerships and supporting communities.” For more information about the IDPH Bureau of Nutrition and Health Promotion, its programs and grants, visit www.idph.state.ia.us/NutritionHealthPromotion/. This entry was posted in Active Living, North Fayette Valley CSD, Oelwein CSD, West Central CSD by Northeast Iowa Safe Routes to School. Bookmark the permalink.